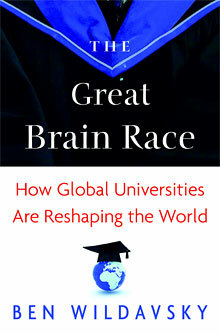 From the conclusion of this essay, excerpted from a forthcoming book The Great Brain Race: How Global Universities are Reshaping the World by Ben Wildavsky. The United States should respond to the globalization of higher education not with angst but with a sense of possibility. Neither a gradual erosion in the U.S. market share of students nor the emergence of ambitious new competitors in Asia, Europe, and the Middle East means that American universities are on some inevitable path to decline. There is nothing wrong with nations competing, trying to improve their citizens’ human capital and to reap the economic benefits that come with more and better education. By eliminating protectionist barriers at home, by lobbying for their removal abroad, by continuing to recruit and welcome the best students in the world, by sending more students overseas, by fostering cross-national research collaboration, and by strengthening its own research universities in science, engineering, and other fields, the U.S. will not only sustain its own academic excellence but will continue to expand the sum total of global knowledge and prosperity. Thanks, Masaru, for the recommendation. P.S. : Here’s a link to a 5 April interview in Inside Higher Ed.